At first glance, the collection of stones by the side of the main road looks like little more than an untidy scattering of objects. As you draw closer, however, you begin to make out some shapes that have clearly been deliberately chiselled; shapes of animals or vegetables, sometimes with geometric patterns. Gigantic ears, loom out of the dust, a goat’s horn, a horse, broken wings, a woman kneeling… Then there is the face of an old woman, her hand held up to her face as if she is whispering a forgotten story to someone. 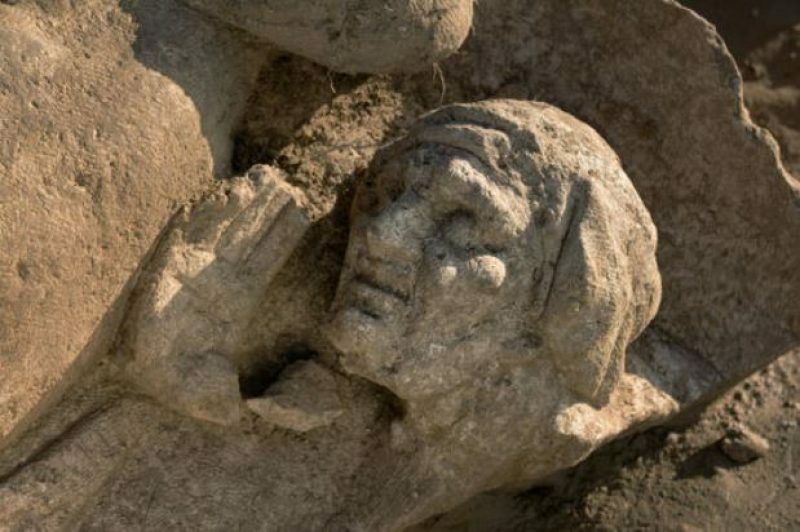 “This old lady is described in two ancient texts that talk about the loves of Venus,” says Véronique Brunet-Gaston, who heads up this archaeological dig on behalf of the Institut national de Recherches Archéologiques Préventives (INRAP) on a site where a shopping centre is planned to be built. It’s in the small town of Pont-Sainte-Maxence in the Oise department – about 50km south-east of Beauvais Airport. The dig has been going on for two months and has only just been presented to the press and it has revealed a shrine that dates from the latter half of the 2nd century AD. Little is known of the purpose of the shrine, but what they do know is the centrepiece of this remarkable find consists of a façade some 90m long, 9.5m high and just 1m thick. This wall was supported by 13 to 17 arcades, its decorated side was facing the sun and it collapsed a short time after its erection. “Something as tall as that would have only needed to have a small error in the foundations for the whole thing to collapse,” says INRAP archaeological architect Chrstophe Gaston, who undertook a reconstruction of the original edifice on paper. “You’d have to be fairly audacious to build a façade like that without any bracing,” he estimates. The statues themselves would have probably survived much better if the wall had fallen the other way, but the archaeological team do take some pleasure in the knowledge that most of these monumental figures lay face-down in the sand undiscovered for centuries. What was the purpose of ornate wall? Towards what religious monument did it lead? The team doesn’t have the answers yet. Of the bronze inscriptions that decorated the wall, only a piece of one letter remains. The ruins are located close to where there was a Roman road linking the ancient settlements of Senlis and Beauvais and to some Gaulish remains. There is no record so far of any significant Gallo-Roman settlement nearby, but in Pont-Sainte-Maxime, ancient disembarkation quays were revealed, which may well lead to other remains being discovered. “At the end of the reign of Antoninus Pius, you’re at the height of the Empire,” says Véronique Brunet-Gaston. During this particularly auspicious period, maybe some wealthy businessmen wanted to express their devotion to the Greco-Roman pantheon by building a monument in their honour? Perhaps it’s a manifestation of the tradition of euergetism – the practice of patronage in ancient Roman society, where the powerful and wealthy built monuments for the edification of the collective. The quality of the stonework leads one to think that artists from either Rome or maybe from Greece would have worked on the project. The divine attributes of the subjects are in keeping with the Hellenic traditions and are carried out with a more refined technique than that of Temple of Champlieu 40km away. Some traces of paint are still visible: a cinnabar red and a pastel green are visible, as well as yellow tones that would have enhanced the brilliance of the building and its statues. So what does one do when one makes such a discovery? The archaeological team are on the clock and the dig needs to end by the beginning of July to make way for the erection of another temple – one of modern consumption. Between this and then, the stone puzzle will be cleared away, with the finest pieces having already succumbed to the greed of looters who already stole coins and a workers’ hut! A three-dimensional reconstruction is also on the cards, but for now, the works continue to try to make sense of ancient mystery of stone.